In response to the current cold conditions, Housing SA has activated its Code Blue emergency winter response for people sleeping rough in metropolitan Adelaide and regional centres across the state. This is the first time the Code Blue has been enacted state-wide. The regional centres include Port Augusta, Port Pirie, Whyalla, Ceduna, Coober Pedy, Port Lincoln and the Riverland. The Code Blue ensures there is shelter available for rough sleepers during extreme weather conditions, such as storms, severe cold and heavy rain. In the Adelaide CBD, the Hutt St Centre, 258 Hutt St, will remain open until 7am on Saturday 3 June to provide shelter from the cold to people sleeping rough. 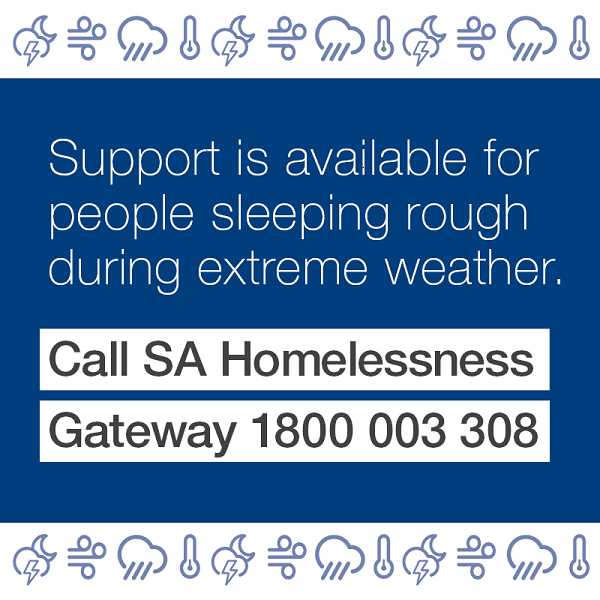 People who are sleeping rough, or people assisting them, including those in regional areas, can phone South Australia's Homelessness Gateway 24/7 on 1800 003 308.